The girls came from every corner of the U.S.S.R. They were factory workers, domestic servants, teachers and clerks, and few were older than twenty. Though many had led hard lives before the war, nothing could have prepared them for the brutal facts of their new existence: with their country on its knees, and millions of its men already dead, grievously wounded or in captivity, from 1942 onwards thousands of Soviet women were trained as snipers. Thrown into the midst of some of the fiercest fighting of the Second World War they would soon learn what it was like to spend hour upon hour hunting German soldiers in the bleak expanses of no-man's-land; they would become familiar with the awful power that comes with taking another person's life; and in turn they would discover how it feels to see your closest friends torn away from you by an enemy shell or bullet. In a narrative that travels from the sinister catacombs beneath the Kerch Peninsula to Byelorussia's primeval forests and, finally, to the smoking ruins of the Third Reich, Lyuba Vinogradova recounts the untold stories of these brave young women. 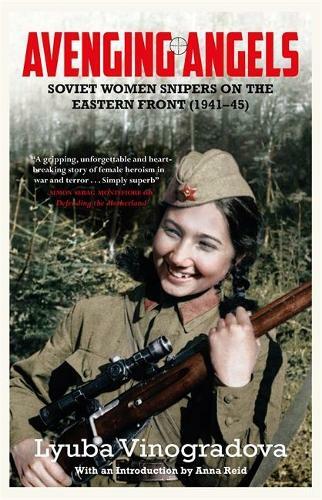 Drawing on diaries, letters and interviews with survivors, as well as previously unpublished material from the military archives, she offers a moving and unforgettable record of their experiences: the rigorous training, the squalid living quarters, the blood and chaos of the Eastern Front, and those moments of laughter and happiness that occasionally allowed the girls to forget, for a second or two, their horrifying circumstances. Avenging Angels is a masterful account of an all-too-often overlooked chapter of history, and an unparalleled account of these women's lives. Translated from the Russian by Arch Tait.